An interview with Melania Raga Bejarano, head nurse in the maternity ward of San Francisco Asis Hospital in Colombia’s Chocó department. Nurse Melania Raga Bejarano checking on a patient who gave birth to a healthy baby-girl at San Francisco de Asis Hospital. 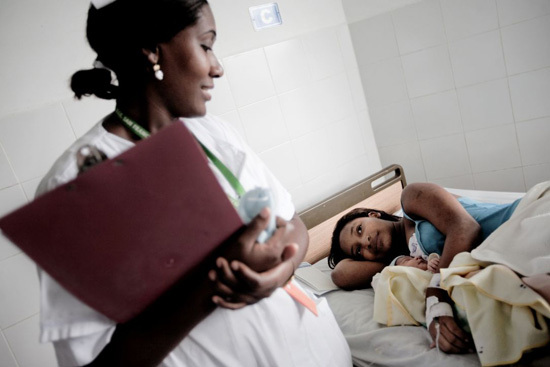 In 2005, Doctors Without Borders/Médecins Sans Frontières(MSF) began providing sexual and reproductive healthcare in the maternity ward of the San Francisco de Asis Hospital in the town of Quidbo, in Colombia’s Choco department. Choco is the poorest region in the country and had one of Colombia’s highest maternal mortality rates. MSF renovated the maternity ward and created a new neonatology service, where babies born prematurely or with complications can receive specialized medical care. And now, MSF has achieved its objectives of improving the quality of medical care for mothers and newborns and decreasing maternal mortality, and will turn over its program at San Francisico de Asis to hospital staff. In this interview, Melania Raga Bejarano, the head nurse for the maternity ward at San Francisco de Asis, talks about the changes that have occurred over the 10 years she has worked at San Francisco Asis, and the challenges that remain. What are your daily activities like here in the maternity ward? We do the rounds. We look after mothers and give them advice. We bathe newborns. We treat their little belly buttons [after the umbilical cord is removed]. We learned a lot of this from the training we received from Médecins Sans Frontières. We give mothers advice on how to feed their babies, we explain the importance of breast-feeding and of treating the baby’s belly button. We tell them to go and see the doctor after eight days. Everything related to care for babies, and also mothers. You have been working here for 10 years. What changes have you seen in the maternity ward in recent years? The most important change is that mothers don’t die anymore. Before, in 2004 for example, we had 14 mothers die in childbirth. This year, so far, we haven’t had a single death in childbirth, and for me that’s the most important thing. Why don’t they die anymore? Firstly, because before we didn’t have the resources to look after them, and now we do. There weren’t enough doctors. There weren’t enough nurses. There wasn’t any equipment. There wasn’t any medicine, and we were in a bad situation. We didn’t have an ultrasound machine or even a wheelchair. There were areas in the maternity ward which had leaks all over the place. When MSF came, the first thing they did was to fix the leaks. And they initially provided us with about 30 beds in the whole area. Today, we have 46 beds just in the maternity hospitalization [where mothers rest after giving birth, or if bedrest is needed for another reason], not counting the delivery room. We’re so well equipped with all these beds. What a change! What else apart from facilities and infrastructure contributed to this fall in mortality? How has your work in particular changed? When MSF came here, almost everything was done by the nurses and auxiliaries. It wasn’t like it is now, where everybody carries out their own role. Everyone from auxiliaries to the cleaning women know their role. Before, the nurses did the doctors’ work because a lot of the doctors were on call and had to go. Now, nobody leaves. We’re all dedicated. That’s been the legacy MSF left. We have these wonderful rooms. Have you seen the delivery room? It’s beautiful. We’re so impressed by it. What other services, apart from deliveries, are offered by the maternity ward of the hospital? Now we have these kits for women who are victims of sexual violence [Post Exposure Prophylaxis kit for prevention of HIV infection after a sexual violence act]. Any woman can come at any time of day and ask for the head nurse on duty. We provide support, call the doctor, and we take tests in the lab. If the case hasn’t been reported and the woman would like it, we contact the authorities in charge. But we provide the initial medical assistance. It was MSF who set that up a while ago. Also, we didn’t used to offer family planning. Now we have the means to offer either temporary methods of contraception such as the pill or injection, or the more definitive method. The whole process can be completed in 24 hours. It’s up to the woman to decide. For us that’s a hugely important change. Mothers are happy and so are staff. What challenges lie ahead for the maternity section now that MSF is leaving? People didn’t used to know whether they were coming here to get better or to die. Changes in maternity had an impact on the community in general, not just in the hospital. We have to try and keep what they have given us in place, maintain it, and improve it even more. We have to do it so that we don’t look back in a few years time and ask ourselves, “What did we do?” We learned things by watching others do them. The staff from MSF came from other parts of the world without having had anything to do with Chocó before. This maternity ward is my life, my family, and I love it very much. We’re going to show that we learned what they taught us and that we’re going to carry on putting it into practice. Despite the end of its activities in Quibdó, MSF continues providing sexual and reproductive healthcare in Chocó region through mobile clinics along the Baudó river.